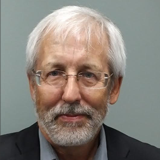 Bill Willoughby, CEO & Director. Cypress Development Corp. (TSX-V: CYP) is a publicly traded exploration company focused on developing the Company's 100%-owned Clayton Valley Lithium Project in the State of Nevada, U.S.A. Cypress' flagship Dean & Glory Project is located immediately east of Albemarle's Silver Peak mine, North America's only lithium brine operation. 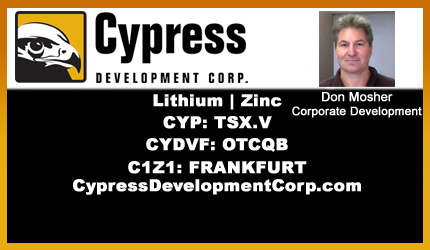 Recent exploration by Cypress has discovered an extensive deposit of lithium-bearing claystone adjacent to the brine field. Metallurgical tests so far have shown the claystone is weak acid leachable with lithium extractions ranging up to 80%. With mineralization tested by drilling over a seven kilometer trend, the apparent size of the deposit makes Clayton Valley a premier target that has the potential to impact the future of lithium production in North America.